Facebook’s May 18 IPO—which set the market value of the social-networking giant at $105 billion—sparked significant discussion on Twitter, blogs and Facebook itself, with more expressions of skepticism than confidence about the stock’s value, according to a report by the Pew Research Center’s Project for Excellence in Journalism. Users of Twitter were the most doubtful, as almost four times as much of the overall conversation from May 14-20 (22%) consisted of claims that Facebook stock was overhyped than it was worth buying (6%). 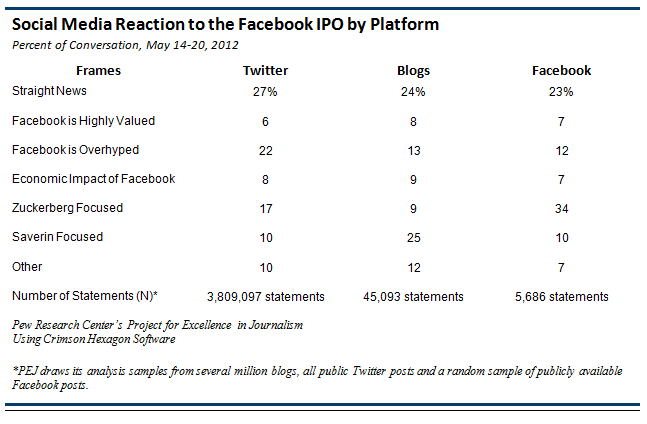 Blogs and Facebook also included more doubt than optimism, although by smaller margins. Even on Facebook, though, the gap was nearly two-to-one. Beyond the straight news accounts regarding the facts of the IPO (which made up roughly a quarter of the conversation across all platforms), the largest topic differed by social media outlet. 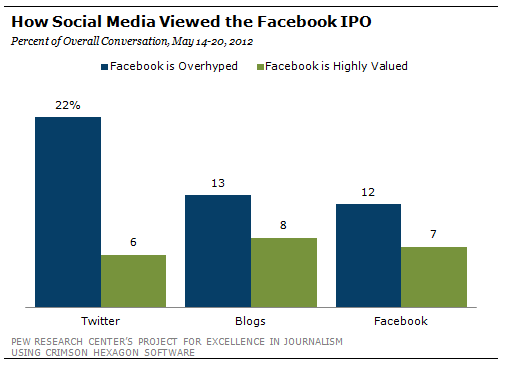 On Twitter, fully 22% of the conversation consisted of suggestions that the value of Facebook was overhyped or overpriced. Many tweets warned against buying stock while others declared that the results of the first day, where the closing share price of $38.23 was just slightly above the initial offering value of $38, meant that the company’s debut had failed. In the blogosphere, a quarter of the conversation (25%) focused on Facebook co-founder Eduardo Saverin’s decision to relinquish his U.S. citizenship just prior to the IPO. Bloggers connected Saverin’s move with larger political and economic debates. Some argued he was dodging his U.S. tax obligations while others claimed his decision demonstrated the dangers of high taxes and regulation. On Facebook itself, more than a third (34%) of the conversation revolved around Facebook founder and CEO Mark Zuckerberg. Some discussed Zuckerberg’s growing financial worth, while many issued well-wishes to him on his May 14 birthday and after learning of his May 19 wedding to Priscilla Chan. 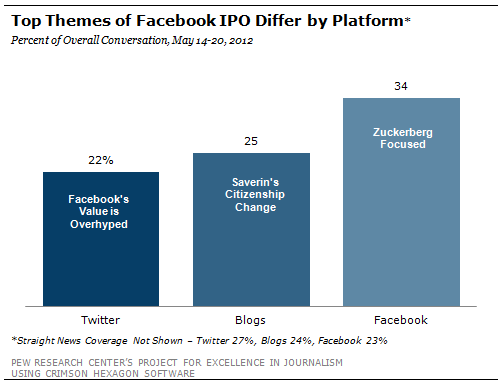 On all three platforms, the tone and focus on the conversations changed little from before and after the May 18 IPO. The exception was the increase in attention paid to Zuckerberg when news of his wedding became public the day following the historic IPO.